High performance Icon Ford 289 forged pistons are premium quality pistons that are available for a very reasonable price. 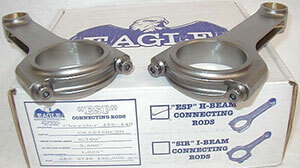 We have these forged piston sets available in a wide range of sizes including standard bore and many popular oversizes. If you are building a 289 Ford engine and are looking for improved acceleration, efficiency and strength then these pistons are the perfect choice for many applications. These 289 pistons can be used in high performance street cars, serious street and strip cars as well as dedicated racing engines. The large variety of piston sizes, styles and compression ratios enables you to get the best specifications pistons for your exact application. Icon Premium series forged pistons are made from ultra heavy duty 2618 alloy. Icon FHR series use 4032 Alloy. These 289 connecting rods are a great match to work with the forged pistons listed above to give you a strong rotating assembly of 289 forged internals. These 289 rods will work with the Icon brand pistons listed on this page as well as with any aftermarket piston designed to use a .912 inch diameter floating wrist pin and a 5.155 inch length rod.